Stratigraphy is the arrangement of geologic layers (or strata), and the branch of geology concerned with studying the order and relative position of strata and their relationship to the geological time scale. 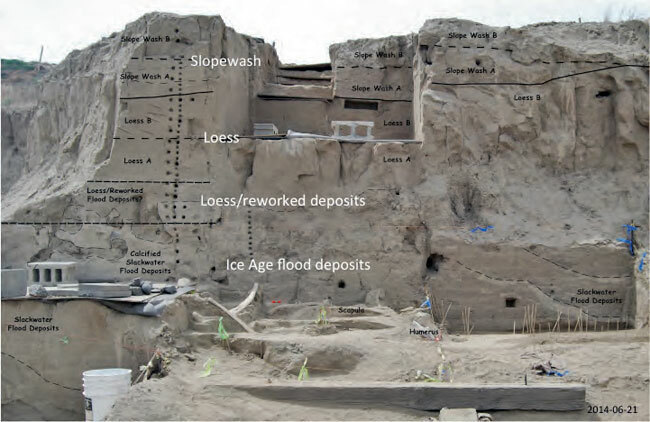 Geologic research, supported by magnetic susceptibility, X-­Ray Fluorescence, CO3 analyses, lithic sand counts, and a variety of other studies, has demonstrated that the mammoth remains are located in fine-­grained slackwater Ice Age flood deposits. This suggests that at least 4 to 7 different flood events may have engulfed the area (Last and Barton, 2012; Hill and Last, 2013a and b; Hill and Last, 2014; Last and Krogstad, 2014; Sawyers and Last, 2014; Last, Barton, and Kleinknecht, 2015). The top of the flood deposits appears to have been overprinted by pedogenic calcium carbonate, and has undergone some degree of bioturbation and reworking (mostly by wind). These “reworked” sediments are capped by a sequence of loess deposits, that is in turn overlain by a sequence of colluvial slopewash deposits. 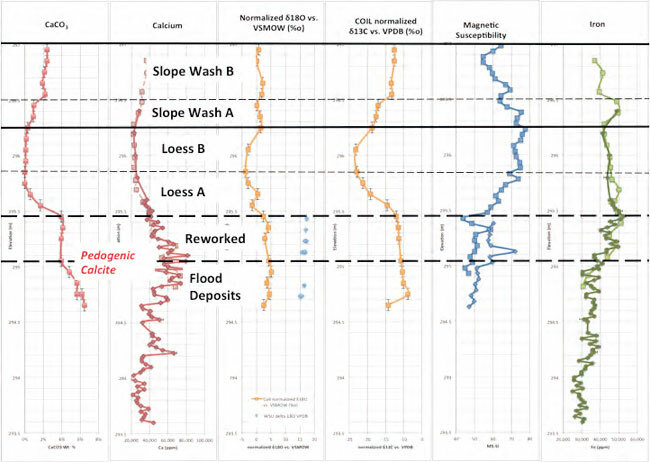 The figure below illustrates how multiple data sets from both sediment samples and in situ measurements collectively support definition of the stratigraphic units. Note how changes in each of these data sets line up with the major stratigraphic contacts.